STEVE MANNING, a financial consultant in Southern California, liked the idea of driving a car that would go easy on the environment. But last November, as he eyed a $58,000 Toyota Mirai at the dealership near his home in Santa Ana, he had to think more than twice. He has no regrets. Because of a big push by the State of California to invest in a growing network of filling stations, he has never run out of fuel. 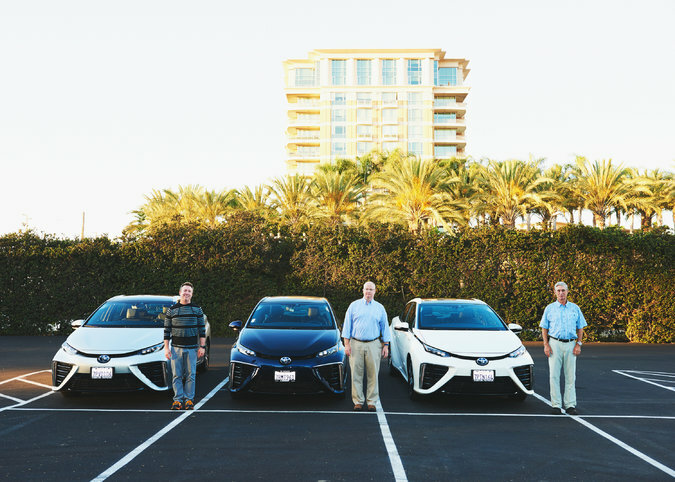 Driving a hydrogen-powered car has proved a pleasant surprise to Mr. Manning and others in California’s small but growing cadre of owners of fuel-cell cars. Like other electrics, the Mirai does not have a transmission and accelerates quickly from a stop. “I can burn rubber,” said Glenn Rambach, a retired engineer who bought one last fall. Mr. Manning, who owns a Toyota Mirai, searches for a hydrogen fuel-cell station in his car. Credit Jake Michaels for The New York Times. But its attributes don’t include being cheap to operate. 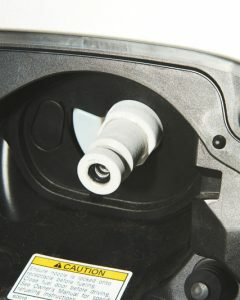 A fill-up to drive 300 miles costs about $75. 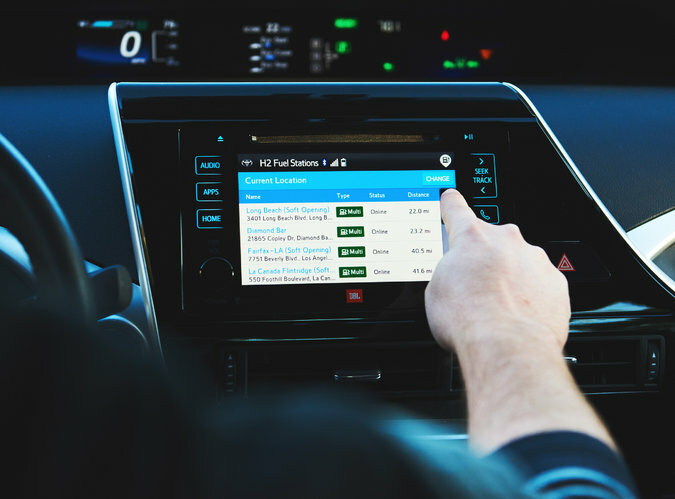 Mirai owners, though, get a credit card, paid by Toyota, for up to $15,000 of fuel over the first three years of ownership. For years, automakers, environmentalists and scientists have promoted hydrogen fuel cells as a breakthrough technology that will eventually enable people to travel without puffing pollutants and greenhouse gases into the atmosphere. Fuel cells operate by setting off a chemical reaction between hydrogen and oxygen in the air. When they bond, an electric charge and a small amount of water are created. A few hundred cells stacked together generate enough electricity to power a car motor. But the hydrogen future has been slow to arrive because of a frustrating predicament: Automakers had little incentive to produce fuel-cell vehicles as long as there were no hydrogen stations to fill them up; energy companies saw no sense in opening stations if there were no cars on the market. So it took financial backing from the State of California, as well as Toyota, Honda and other automakers, to spur development of hydrogen fueling stations. Twenty are now open to the public, and three more go into service this month. The number should rise to 50 by the end of next year, according to California officials. California also encourages zero-emission cars by letting them use the swift, high-occupancy vehicle lanes on the famously crowded freeways. The state also offers tax rebates to consumers who buy or lease hydrogen-powered cars, which in the case of the Mirai is worth $5,000 — in addition to a $8,000 federal tax credit. But California is a rarity. Other than some experimental publicly supported projects with hydrogen fuel-cell cars in Washington and the Northeast, there is no hydrogen fueling-station network elsewhere in the United States to support the sale and use of the cars. And only a few other countries in the world actively support the technology. Japan, where Toyota has been selling the Mirai since late 2014, now has about 80 fueling stations. South Korea has about a dozen hydrogen stations and is investing to build more as Hyundai nears the debut of its Ioniq fuel-cell car. In Europe, Mirai sales recently started in Denmark, which has nine stations, as well as in Britain, Belgium and Germany. But Toyota expects to sell only about 100 of the vehicles in Europe this year. Mr. Manning now has enough fueling options in Southern California to cover his 45-mile commute to Playa Vista with little anxiety. He runs 90 miles down to San Diego three or four times a month, a trip that consumes more than a half a tank of hydrogen. But now he can swing off the freeway to a station in San Juan Capistrano to top off along the way. 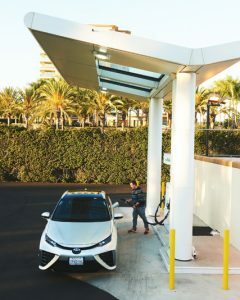 Despite the support of California’s government, which has set aside $46.6 million to subsidize the development of a hydrogen station network, “it’s going to take some time for this to really take off,” said Shane Stephens, chief development officer at FirstElement Fuel, a start-up that has received a grant from the state and operates a chain of 13 TrueZero fueling stations, with six more under construction. Fewer than 350 hydrogen cars are currently registered in the state, and Toyota expects the total of Mirais to be only about 3,000 by the end of next year. But California officials predict that more than 13,000 hydrogen cars will be in operation on its roads by 2019. And after Toyota introduces a new version of the Mirai around 2020, the company thinks its sales will rise to about 30,000 cars a year. Honda plans to sell a hydrogen-powered Clarity sedan by the end of the year. Hyundai, which has been leasing limited numbers of hydrogen-powered Tucson sport utility vehicles, plans to sell hydrogen-powered Ioniqs in the state in 2017. Mark Johannessen, a family law attorney who lives in West Sacramento, bought a Mirai late last year and had “a bit of a nail-biter” early on while driving the car 115 miles to an office in Santa Cruz. “I had about five miles left in the tank,” he recalled. But two stations have since opened along his route. Fuel-cell technology has its detractors, mostly because of the question about fueling stations. Elon Musk, chief executive of the electric carmaker Tesla Motors, has called hydrogen “an incredibly dumb” way to power cars. Still, other automakers are convinced that hydrogen fuel-cell will become a crucial piece of the industry’s future. Battery electric vehicles are still limited to a maximum of about 200 miles of driving before a recharge is required, and charging up can take time — four hours or more in some cases. Batteries are also heavy, which presents challenges for powering larger vehicles like trucks or S.U.V.s. Fuel-cell vehicles, on the other hand, can go up to 300 miles on a full tank. Refueling is about the same process as filling up with gasoline and takes three to four minutes. And though hydrogen might be associated in some people’s minds with the fiery explosion of the hydrogen-filled Hindenburg airship in 1937, proponents say the fuel system as designed in the Mirai and other comparable cars make them no more volatile than gasoline-powered vehicles. “If we’re really going to make a significant reduction in carbon emissions, you can only do that with fuel-cell vehicles in the mix,” said Craig Scott, national manager of advanced technologies at Toyota. Mr. Rambach, the retired engineer, shares that view. He puts about 1,000 miles on the car a month, driving into Sacramento, where he gives tours at an auto museum, and taking occasional 130-mile trips to the San Francisco area. And since a new station recently opened up in Truckee, near Tahoe, he’s able to use the Mirai for the 100 miles up to skiing country. A version of this article appears in print on July 22, 2016, on page B4 of the New York edition with the headline: Fuel Cells Gain a Following, With a Push From California.